I know I have not posted in a while. I have had a busy couple of years! In 2011 I gave birth to my first child, which was a major life change for me. I never really quit working on projects, as I love it so much, but I have not had quite as much time to photograph and post. We have a lot of catching up to do!!! I will start with this lovely gem that I am so proud of. In 2011, I feel as though I gave birth to two children–my son, Case Jackson McBroom, and this beautiful house in Santa Rosa Beach’s beautiful Watercolor! I was blessed to meet this client early on in the building phase. 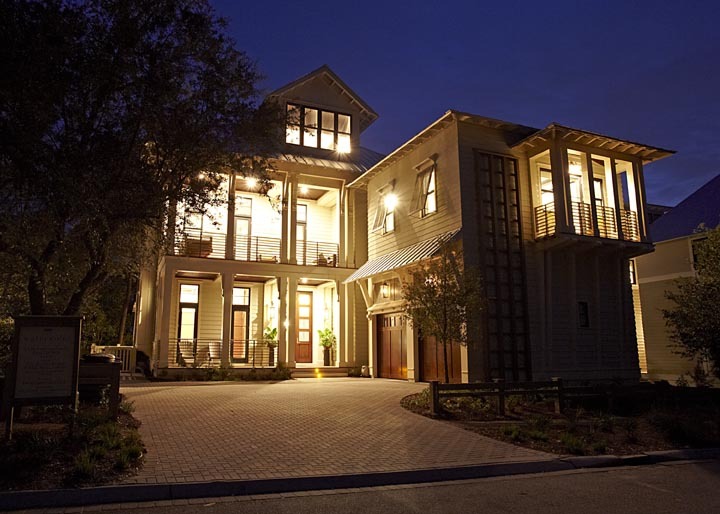 I was able to work as lead designer, hand-in-hand with the client, the builder, John Brown with Gulfview Construction, and the architect, Matthew Savoie. So, instead of being handed a house and asked to furnish it or improve it, I was able to get my hands on this house as framing was going up, and have important leading direction on style, finishes, lighting, interior details and finishes, custom built-ins, etc. This is a designer’s dream come true! 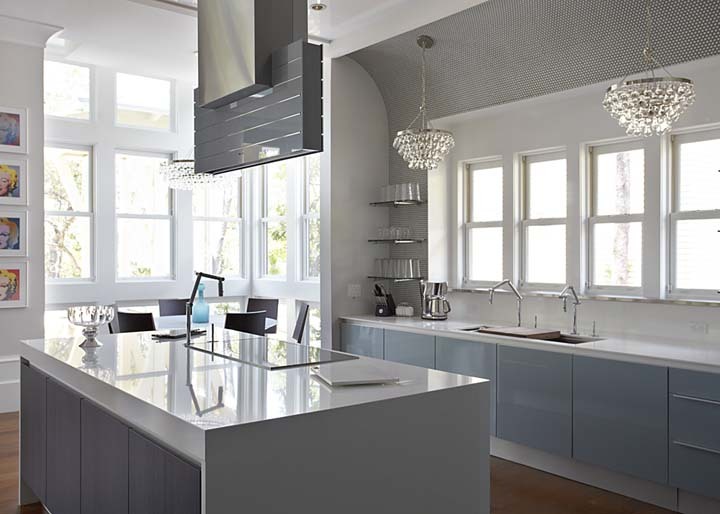 The overall concept for this design was modern, light, airy, open, clean. 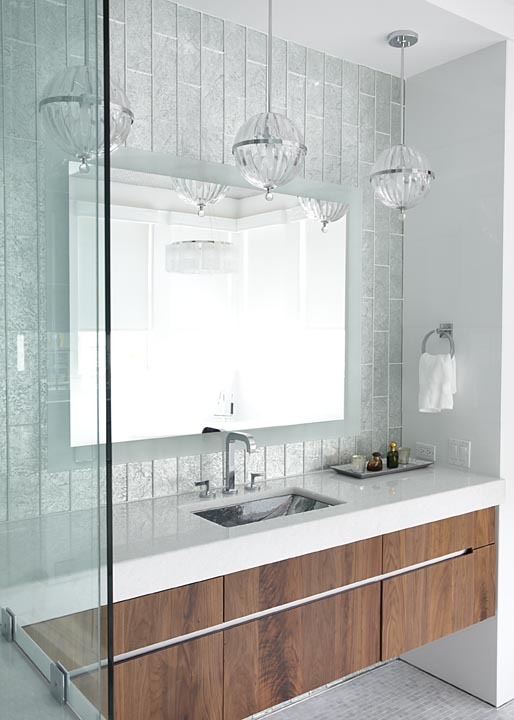 Warm wood tones and textural stone is balanced with cool gray-blues and reflective surfaces. In the kitchen, we used Poggenpohl cabinetry in both a shimmering blue color, and a dark wenge wood finish for contrast. The backsplash over the sink is Ann Sacks penny round tiles, and the bar front is Ann Sacks rectangular ceramic tiles. I love the way the wall over the sink curves into the ceiling. To accent this bit of unique architecture, we designed a simple recessed cove at the top of it, which hides l.e.d. strip lighting and helps to show off the tile. 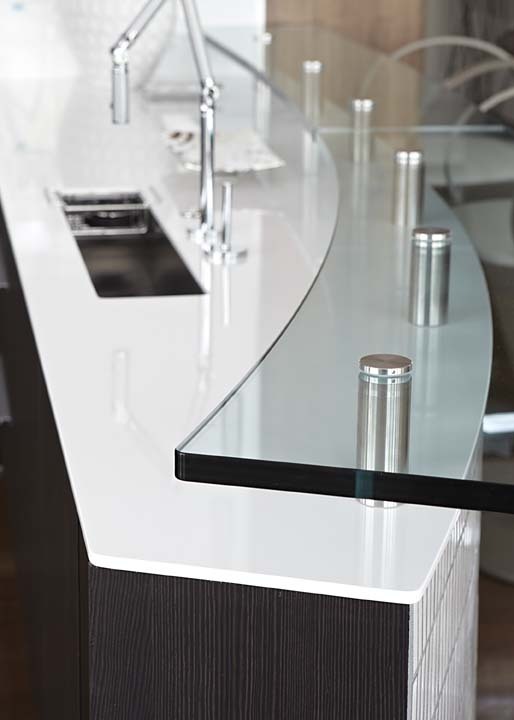 The island has a solid surface counter surface, which waterfalls to the floor on each side. 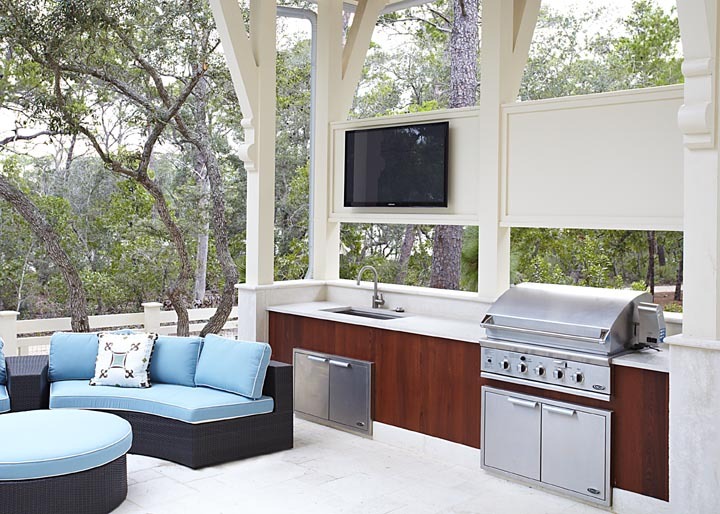 This gives the island a custom, unique and modern feel. 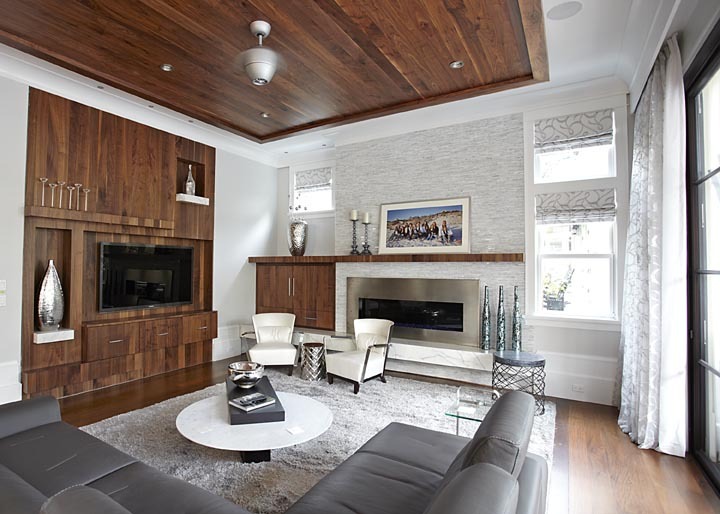 In the Living Room, we chose to have two focal points–the fireplace and the media wall. 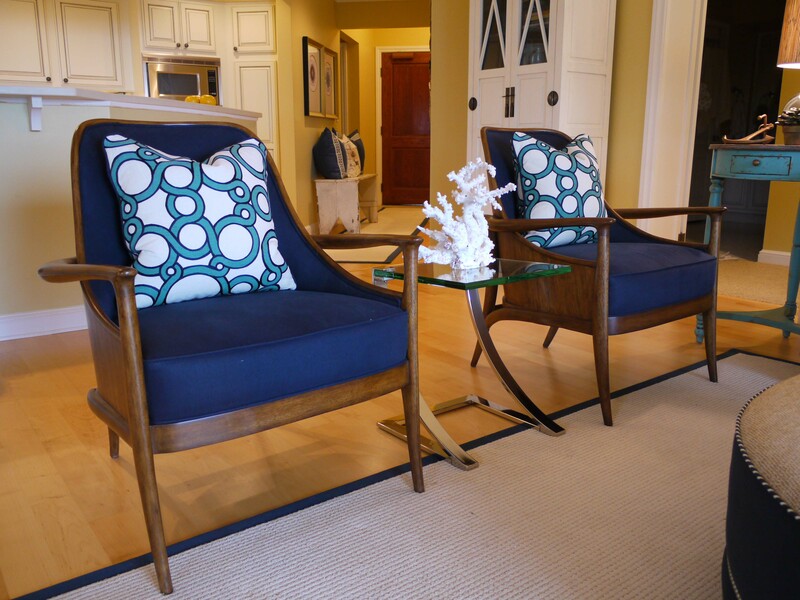 Instead of competing with each other, the two areas are made integral to one large, balanced and aesthetically pleasing room. We did this by designing the hearth, mantle and shelves with horizontal lines that seem to “point” and include each other as part of the whole, and with alternating wood and stone. The fireplace is surrounded in textured Carrera marble. The media wall is all custom from my designer drawings. 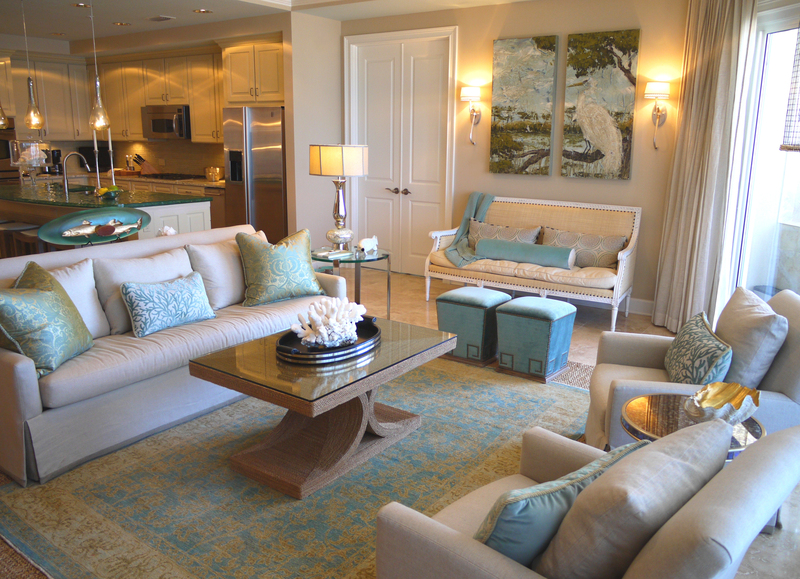 In the Living Room, we specified a dark gray leather sectional and two unique arm chairs, then anchored the room with a large light gray shag area rug. In the Dining Room, we used a large bubble glass chandelier by Currey & Company. 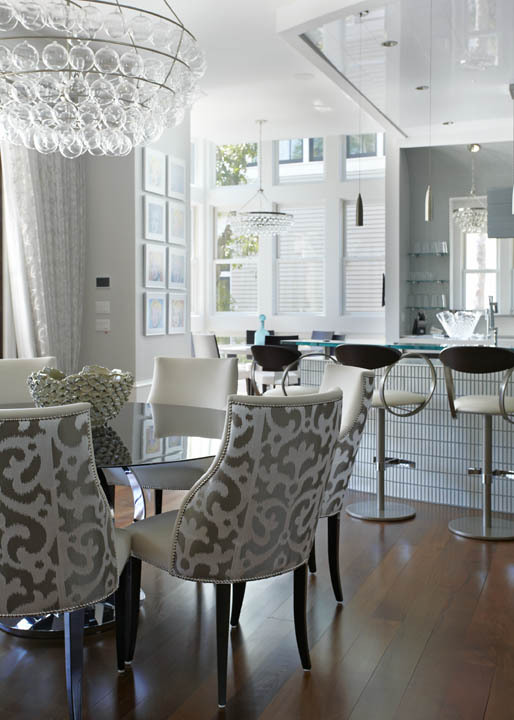 The Breakfast room and kitchen have bubble glass “Bling” chandeliers by Robert Abbey. The dining chairs are neutral, except for the fabulous Romo Fabrics print on the outbacks! 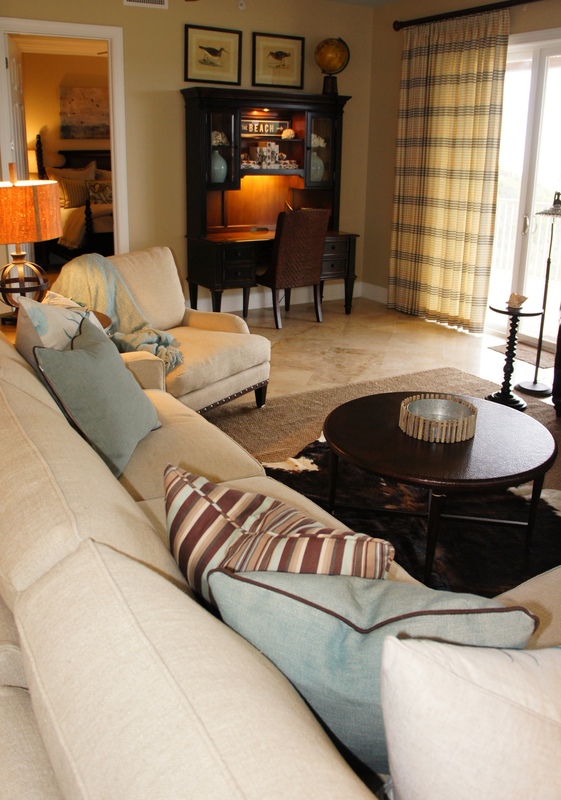 The room needed this touch of fabric and pattern to warm things up. 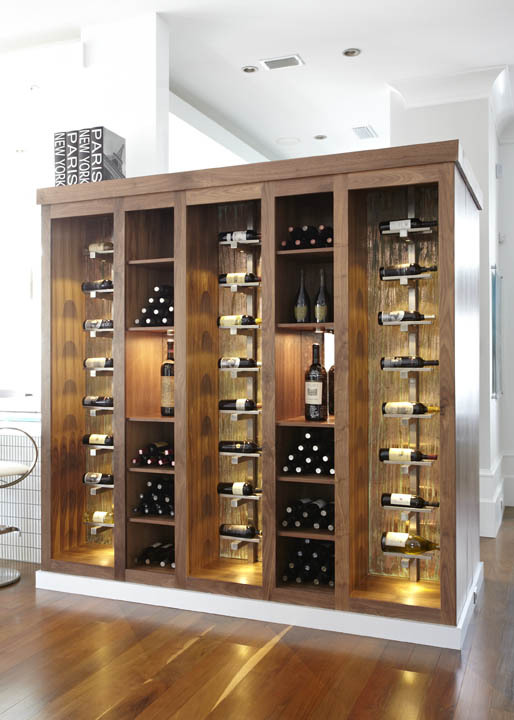 We designed this wine storage onto a floating wall that divides the kitchen and main living areas. 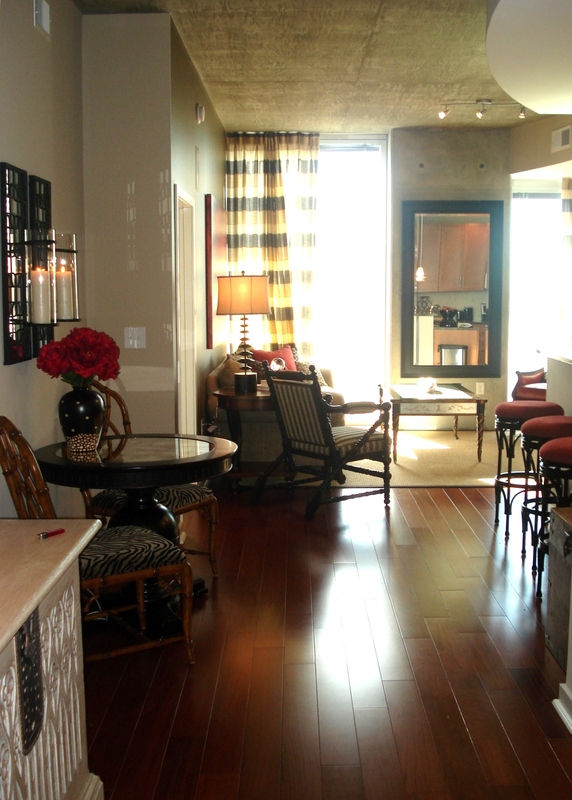 Here we have a blast of warmth glowing out from the wood tones, the aged copper backdrop and the hidden accent lights. Storage shelves were broken into two sections by three backlit vertical chrome display racks. On the first floor, right off the kitchen, is an open office nook. 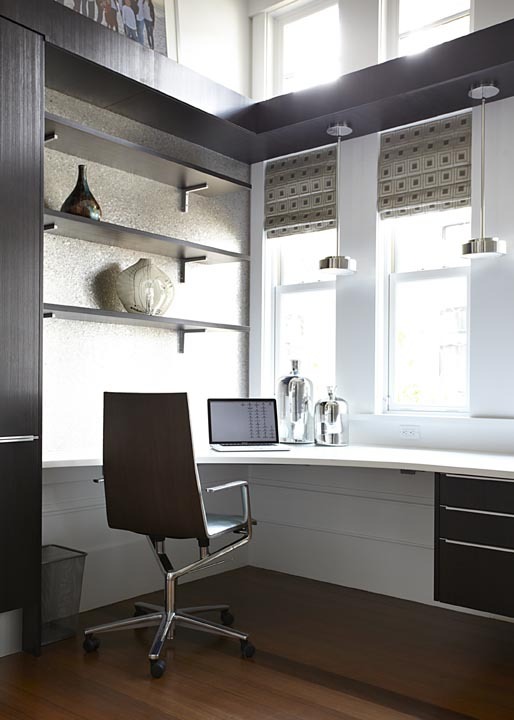 The shelving and lighting was strategically designed and placed around the room’s architecture. 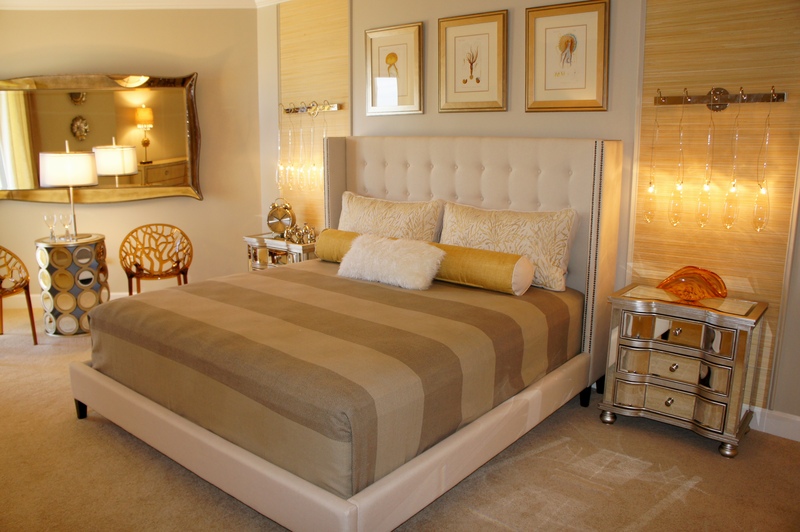 We accented this room with a sparkling pearl mica wallcovering. On the walls of the main office, we separated the walnut wall paneling with stainless steel reveal strips. This not only provided a modern linear design to the room, but also added some sparkle that helped lighten up all the wood. It was really fun getting to work on my very first media room! I am proud of how it turned out. 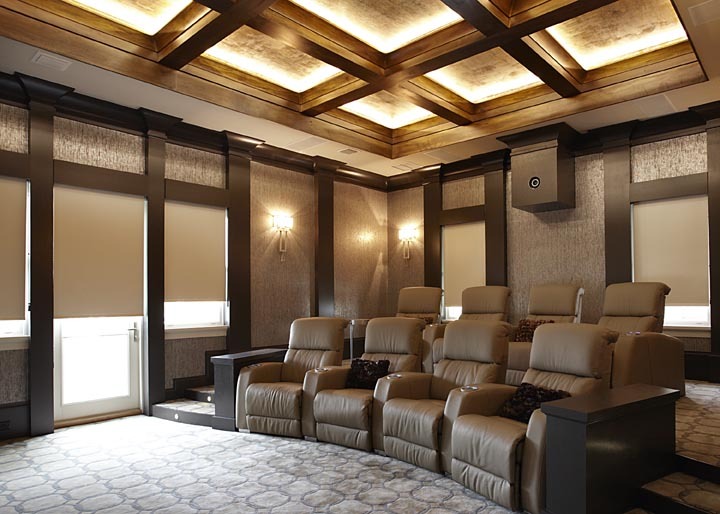 When I googled “theater rooms” I was berated by image after image of gaudy, over-the-top rooms with puffy marshmallow chairs and wild window treatments! I wanted this room to be masculine, feel luxurious and high-end, but also be clean and modern enough to still mesh with the rest of the house. Gray-blue grasscloth on the walls add visual texture and richness, and have bonus acoustic benefits. 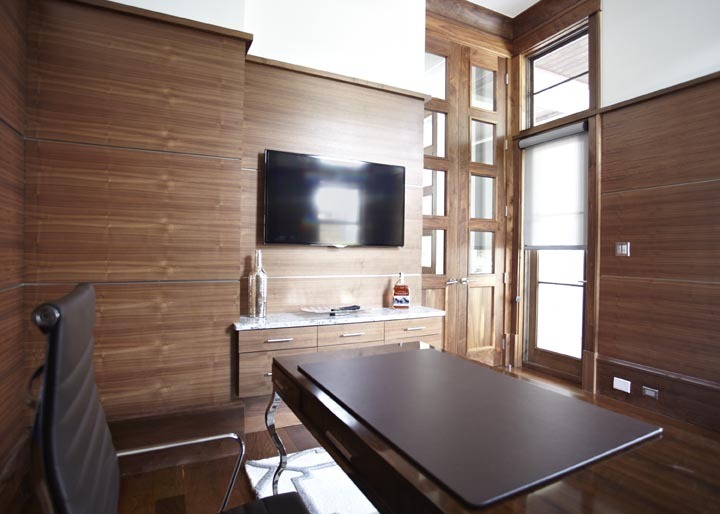 The windows have motorized roman shades that recess into walls when opened. The wall sconces are by Fine Art Lighting. Above is an image of the wet bar in the media room. Ahhhhh…. the Master Bedroom! This room came out so serene and simply beautiful. 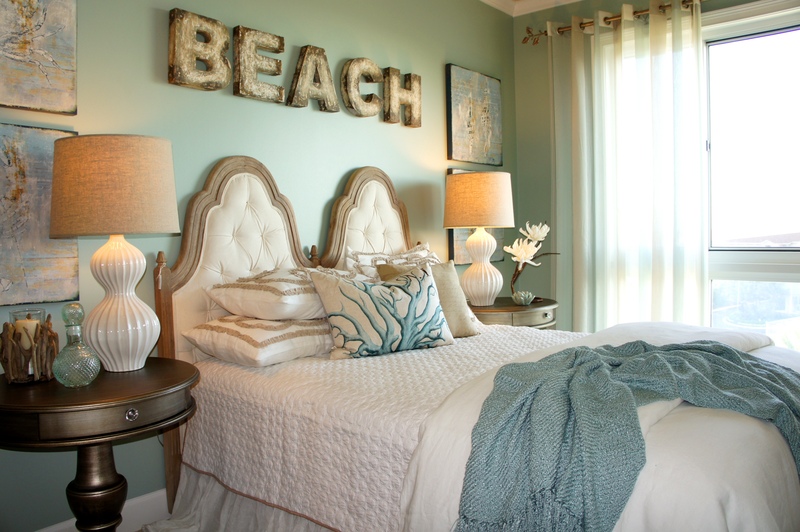 The charcoal gray accent bed wall helped to add intimacy and warmth. the fireplace is surrounded by capiz tiles that shimmer. We designed the hearth to continue down the wall and underneath the built-in dresser. The door to the Master Bathroom is actually a hidden door when closed that plays into the wall paneling–beautifully designed! Off-whites and grays keep this room quiet and serene, and let the view and architecture do the talking. 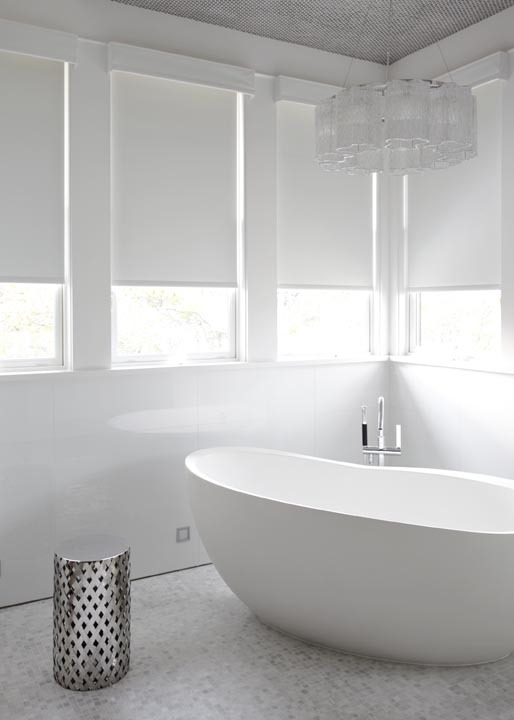 The Master Bathroom is super clean, modern and absolutely beautiful in its simplicity! We used an organic-shaped Waterworks soaker tub. This area was accented with art glass light fixture, which sparkled against the stainless steel penny rounds in the ceiling. The Master vanity area is a product of many months of designing, redesigning, redrawing, discussing… the result is stunning! We decided, in the end, to go with a double vanity that is symmetrically separated by a perpendicular section that supports a tall, glass-enclosed fireplace! Stunning when on! below the fireplace we designed shelving for towels. 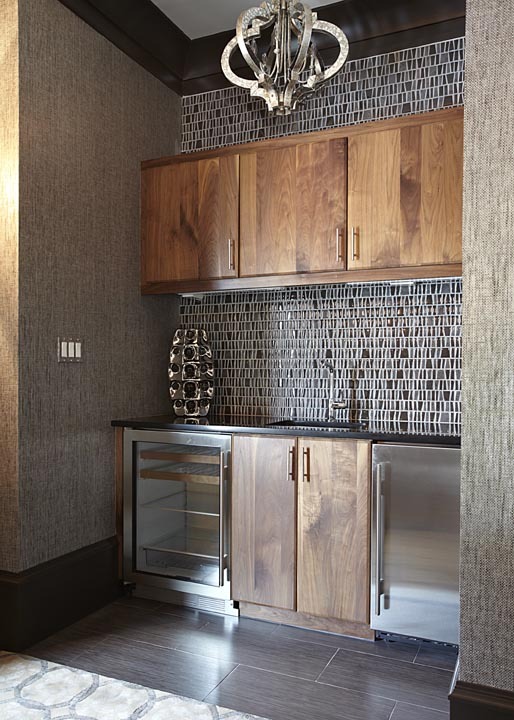 The backsplash has large staggered metallic-backed glass tiles. The natural color of the glass give the tiles a green-blue tint, which is amazing with all the white, and especially with the wood tone of the cabinetry! The mirrors are from the Electric Mirror Company. 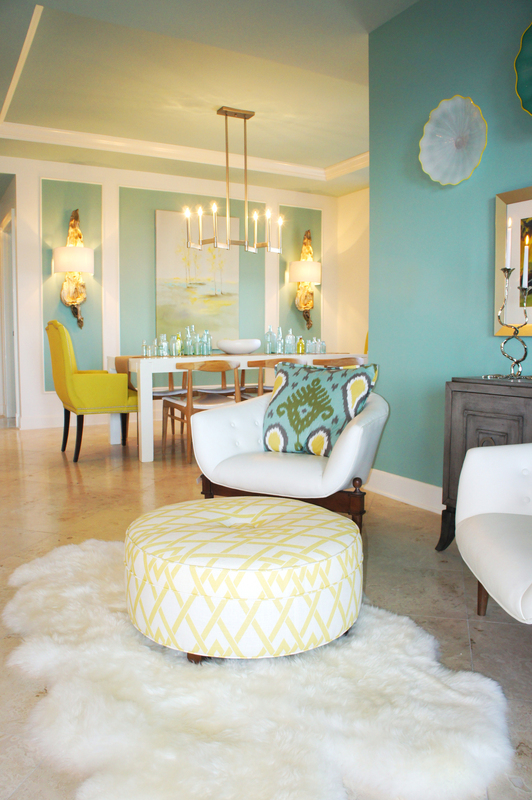 The globe pendants add a touch of glam and some extra sparkling light! 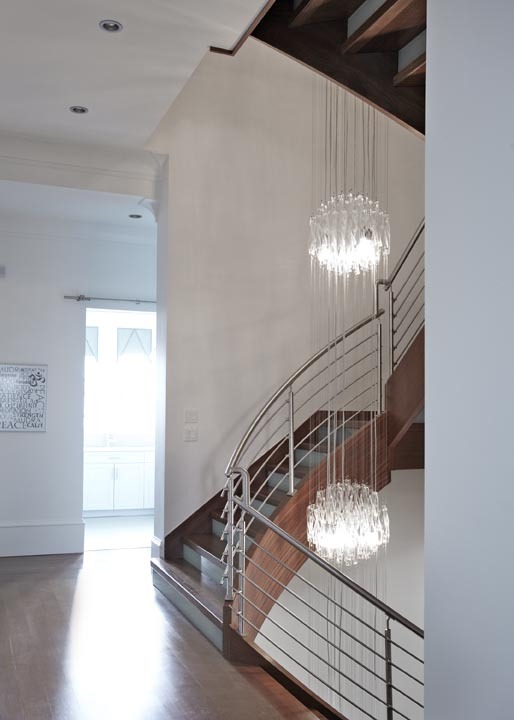 I had the opportunity to design this 3-story light fixture that tied all three floors together in the center of the stairwell. 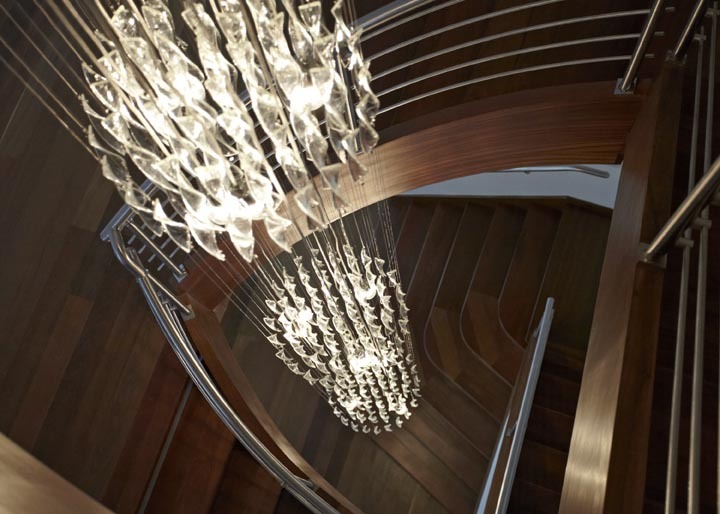 The bulbs glowed through twisted ribbons of glass, which were suspended from long wire. I’ve never designed a large light fixture like this before, so it was fun to see this be born from my own ideas and drawings! The outdoor pool turned out stunning! 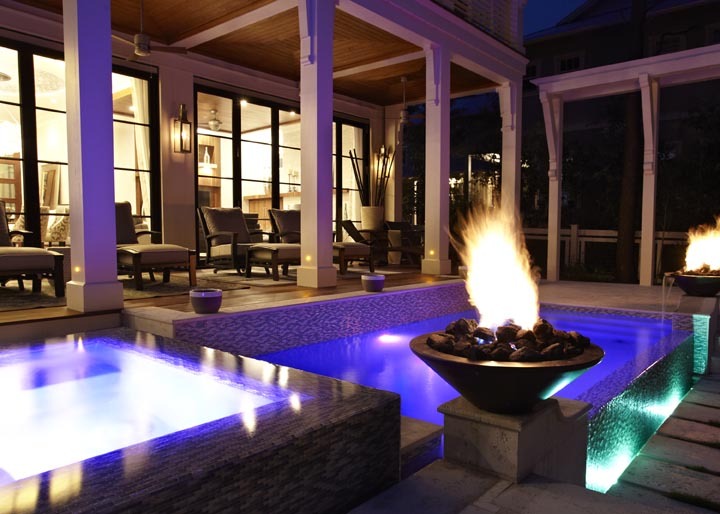 The blue glass pool tiles provide the perfect splash of color, which was reinforced in the upholstery. 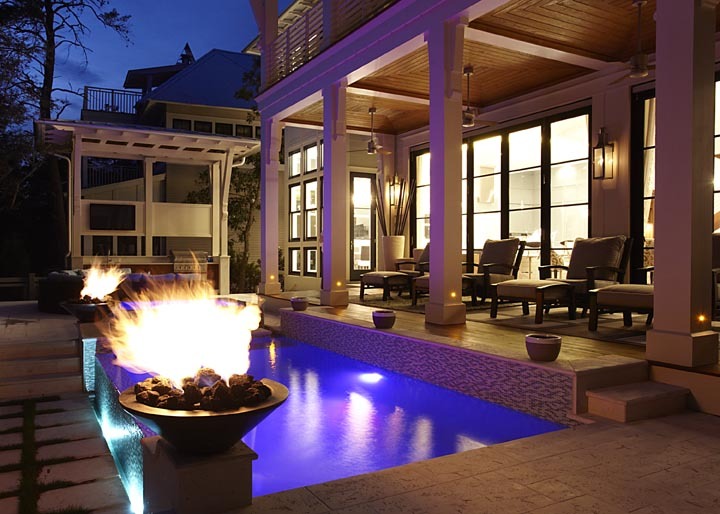 The outdoor fire pit/torches provide the perfect ambient lighting for evening entertainment. The doors all along the living area are on a track that allow them to open up completely, so that the living area becomes a part of the outdoors. I love the way the house lights up at dusk, and the way for a short amount of time, the outside blends seamlessly with the inside, as though the glass were not even there! Here is a view of the front façade at dusk. This house was a dream to be a part of. Like any labor of love, it was built with a lot of blood, sweat and tears, but the end result was worth all the hard work! There are many more rooms not shown in these photos. I will be taking some of my own pictures of the rooms I’ve left out soon! My photos won’t be quite as stunning, but will be better than nothing, so stay tuned!!! 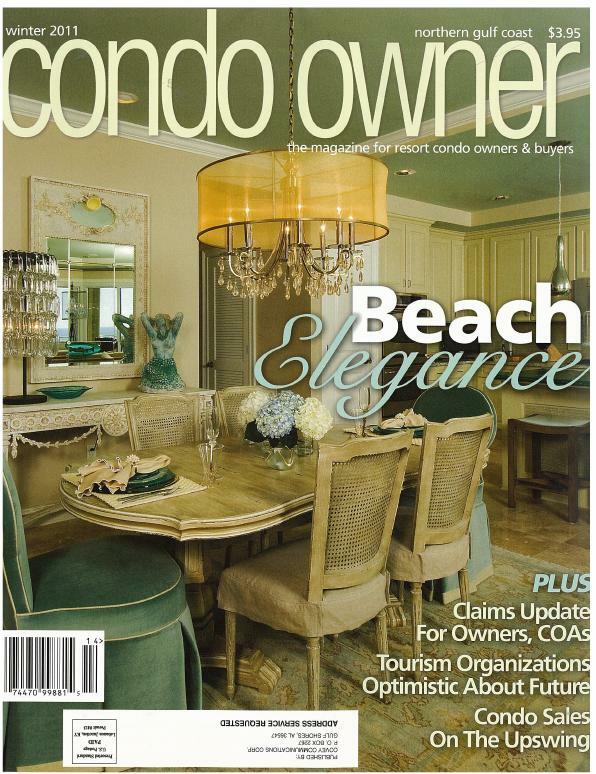 If you need a designer to help you organize your home build or remodel, please contact me!